Why install a high-level enclosure? Are you looking to transform your swimming pool into a luxurious leisure space? With a high-level enclosure, you can enjoy supreme comfort and make the most of your pool. Discover the benefits of a high-level enclosure. The “residential” high level enclosure par excellence provides high amounts of space with maximum heights ranging from 2 to 3 metres. Its spaciousness allows users to move freely around the pool and create a luxurious living space. 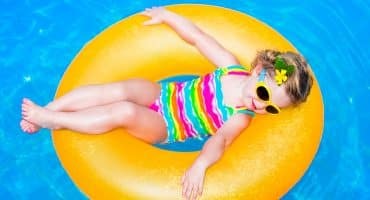 When the swimming pool is heated, it can be considered an indoor pool that can be used even in midwinter ! The extremely versatile telescopic models can be fully or partially retracted during the summer months. Whether free-standing or adjoined to your house, the high-level enclosure creates an extra living area for your home. The free space surrounding the pool can be used however you wish, for example as a relaxation area complete with furniture, a wellness area (spa, hammam) or a living/leisure area for all the family. When the enclosure is adjoined to a house, it provides direct pool access and can act as a natural extension to your living room. 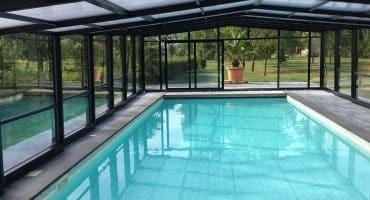 By sheltering the pool, the enclosure allows users to swim without needing to worry about temperamental weather conditions. The enclosure acts as a greenhouse, trapping the heat inside creating ideal swimming conditions even late into the evening. With its glass walls, the Vénus high level enclosure has all the aesthetic appeal of a conservatory whilst being able to open and close to suit the weather and season.